A beautiful and engaging new fully interactive picture book app for children brings to life the story of New Zealand's lost huia bird. With animation, music and lots to discover and interact with, illustrator Stacy Eyles and creative director Julian Stokoe engage children with the story of this large orange wattled forest bird, which disappeared from our forests some time last century. Narrated in te reo and English by George Henare, children tap and drag on the images to explore what happens with the arrival of strange creatures in the huia's habitat. The app is intended for children over six years. 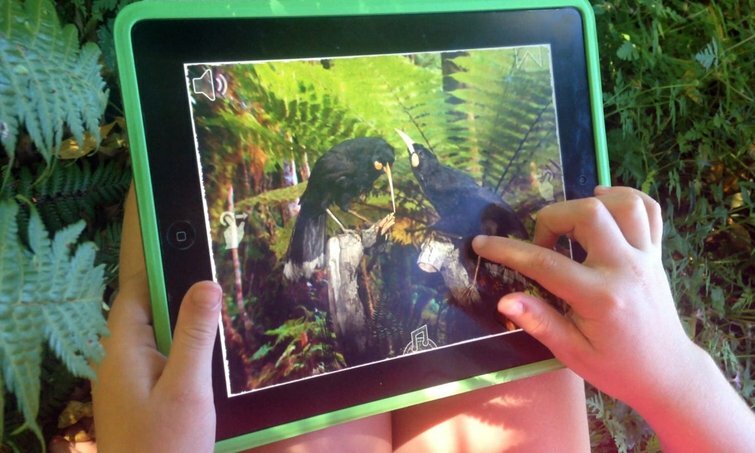 There are also worksheets and suggested activities for teachers and parents to extend the learning possibilities with this app, to be found on the 12 Huia Birds website. 12 Huia Birds app is available to download for free on the iOS App Store, Google Play and Amazon. "The huia might have vanished but their story can still live on to be understood by the current and next generations. Even now we are repeating the same actions that led to the extinction of the huia such as with Māui dolphin and New Zealand’s kauri forests."